As the holiday season marches on, spooky Halloween decorations are being replaced. But, before they have all crawled away, let’s take a moment to consider one commonly feared Halloween staple: spiders. So, how did these “arachnids” (spiders aren’t insects!) become a symbol of horror and Halloween? The easy answer is that, for some reason, we all simply think that they are creepy! During medieval times, they came to be associated with witches and bats as creatures of the night, along with several superstitions. 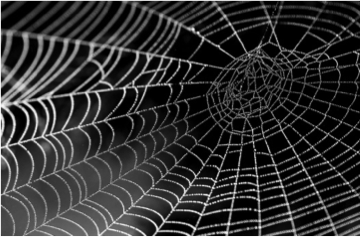 Of course, we can’t talk about spiders and Halloween without mentioning their elaborate creations: spiderwebs. We’ve all seen them — sometimes large and complex, other times just a string dangling from the ceiling — but what are they used for? Different spiders use webs for different reasons (while some, such as the Carolina Wolf Spider, don’t make webs at all!). These include traveling from one place to another, protecting their eggs or entrance to their home, or the most important role: trapping their next meal! No matter what the reason may be, it is important that spiders build their webs to be both strong and sticky for catching invaders and food. To do this, spiders make their own silk. Inside of their body, female spiders have special glands (think of sweat glands!) that produce silk. The spider uses her hind legs to pull the silk out of two tiny openings on the body called “spinnerets” and uses her feet to build her masterpiece! There are two kinds of silk: sticky “viscid” silk and non-sticky “dragline” silk. If you imagine a classic spiderweb, the non-sticky silk makes up the straight lines that give the web strength and structure, while the sticky silk makes up the spirals. You may wonder – so, how does a spider keep from getting stuck in its own web? The answer is simple – they only walk on the non-sticky threads! Spiders are truly engineers of the animal kingdom, making many types of complex designs. The most common type is the orb web – this is the classic web used for decorations and drawings. Another type, called a “funnel web”, looks more like a sheet of fabric, with a large opening leading down to where the spider waits for an unlucky grasshopper to wander in. These different patterns can help the spider in many different ways, from attracting insects to helping camouflage and hide themselves from hungry birds! 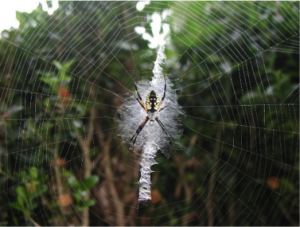 The bright yellow garden spider in particular has a unique web, in which it uses thick silk to create bold zigzags called “stabilimenta”. (If you’ve seen Charlotte’s Web, this is what Charlotte the spider uses to spell out messages in her web!) No one knows exactly why these spiders do this, but some spider scientists (“arachnologists”) believe that this pattern helps attract prey. They think that the pattern of silk might reflect light in a way that tricks insects into thinking nothing is there! Others think that this zigzag pattern tells bigger animals to not destroy its home! 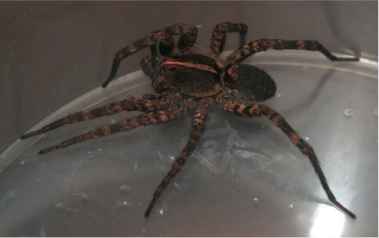 Even though they are often portrayed as creepy, crawly monsters, spiders are some of the most important natural predators we have for other invasive insects. Most spiders are peaceful towards humans and won’t bite unless startled or threatened, and even fewer have venom that is dangerous for us! So, the next time you see one of these beautiful arachnids in your house, try to remember to appreciate their creativity and skill, and very carefully take them back outside! Want to know more? Check out this website with tons of cool articles about things you may wonder about!